Although I’d looked at arsenal.com probably hundreds of times in the past half dozen years, I’d never before noticed a section devoted to Arsenal supporters clubs worldwide. A few weeks ago, I came upon this and discovered a number of US Arsenal supporters clubs, including one in Chicago. The Chicago Gooners congregate for games at The Globe Pub. I had intended to watch the FA Community Shield match at the Globe, but I had another obligation that afternoon that prevented me from being able to add transit time to the pub from my home in Lombard. I am looking forward to watching a match in the near future with “my people,” as my husband calls them. supporters club that gathers at the Fleet Street Pub. This morning when my daughter and I were talking about what we’d like to have for dinner, my daughter declared that she wanted mashed potatoes. 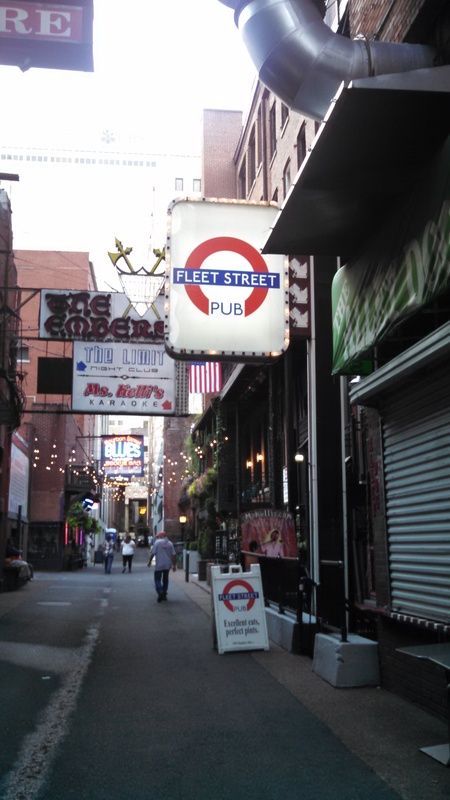 We googled “best Nashville mashed potatoes,” and a restaurant that came up was Fleet Street Pub. We looked at the menu and it looked awesome. And it was home of the Nashville Gooners, so it seemed meant to be. We noticed that the menu didn’t actually seem to have mashed potatoes, but what it had looked yummy. We made use of our hotel’s complimentary shuttle which dropped us off in the Printers row area. The entrance to the pub was akin to going down to the London Underground, which was kind of the point. Just now as I typed that it was “charming,” my daughter described it as “dingy.” One woman’s charming is another’s dingy, it appears. I think we can agree that charming and dingy can coexist. We walked through the bar and sat down at a table. What surprised me somewhat was that it was smoky. Smoking in bars has been disallowed in Chicago (and most other places in the US) but apparently not in Nashville. Honestly, smoke in bars is not something I miss. The Fleet Street Pub seemed on the inside a great dive of a pub, a fun place to watch a game. Someone came along to take our drink order. I was looking at the beer options and my daughter ordered a water, at which point an ID was requested. It appears that Fleet Street Pub is possibly only a pub and not a restaurant, though that leaves a puzzle as to exactly what menu we’d been looking at in the morning. In any case, we were politely requested to leave, which we did. Mashed potato-less in the extreme. Ergo, what I can tell you is that Fleet Street Pub looks like a fun place to watch a match and has a great selection of beers, one of which I would like to have had. Maybe if my daughter actually does go to college in Nashville, I’ll have opportunity to do both. We ultimately had dinner at Demos’ and the brown butter garlic spaghetti was to die for.